I just got this great blemish tool kit from Rustin Enterprises. It comes in a great black leather case that zips that you can use to store everything in. I love the case it really helps to keep the tools organized and maintained. Inside you get five different blemish tools. They each are great for different blemish removal. It’s a very nice well made set, made of stainless steel. I have a daughter that suffers from acne and she has been using these tools to remove blackheads and pimples, they work really well and are easy to use. You get different sizes and tools that can help with any blemish. INCLUDES FIVE STAINLESS STEEL PUSHERS AND PIMPLE EXTRACTORS – Pimples come in all sorts of different sizes. That’s why we’ve included all of the acne utensils you need to tackle the toughest pimples and get back to having silky smooth skin. EASY TO USE – Our acne removal tools are designed with professional quality in mind and are optimally balanced for self-removal of hard to reach blackheads. 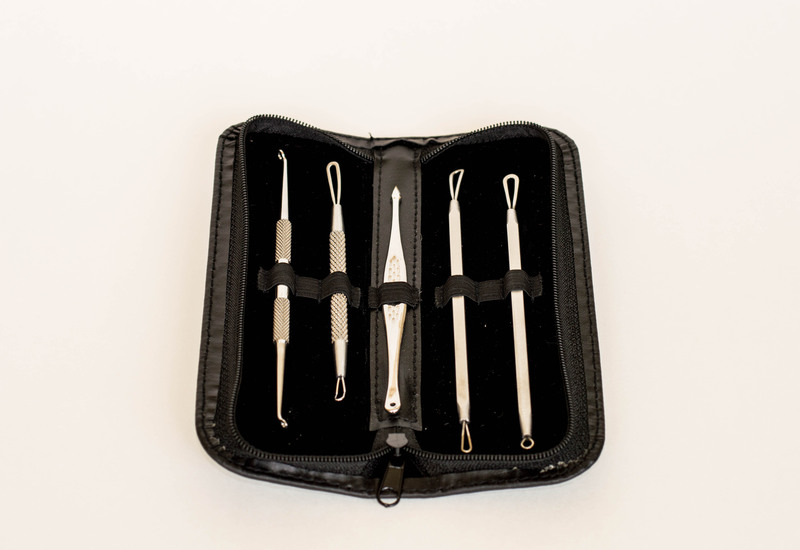 TOP QUALITY STAINLESS STEEL – You won’t have to worry about breaking one of the instruments from this blackhead extractor kit. They are made with medical grade stainless steel and built to last a lifetime. LIFETIME GUARANTEE – We offer a rock-solid lifetime guarantee. If anything goes wrong with your blackhead removal tool kit, just let us know and we will give you a refund, no questions asked.